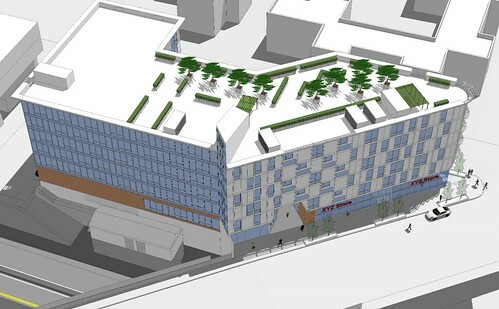 Approved six-story mixed-use LEED Silver-certifiable building located steps to the Broadway rapid transit station. The Freeport will feature 114 condo units, including 20 studios, 73 one-bedrooms, and 21 two-bedrooms. 20 units will be designated affordable. Approximately 6,590 square feet of retail space will be located across the building’s first two levels. Resident amenities will include a communal rooftop deck with sweeping Boston skyline and harbor views. A sun-bathed landscaped public courtyard will be located on-site fronting B Street. Retail occupants at The Freeport will include Ultimate Self Defense Gym (currently located on Site) and a car rental location. The developer has secured a Letter of Intent from a major car rental agency. A two-level below-grade parking garage will contain 120 parking spaces, a number of which will be reserved for the car rental company’s vehicles. Navem Partners have acquired the property at 270 Dorchester Avenue in South Boston for $14 million. The approved development calls for a six-story mixed-use LEED Silver-certifiable building located steps to the Broadway rapid transit station. The Chandlery will feature 114 middle-income residential units, including 20 studios, 73 one bedrooms, and 21 two-bedrooms. 20 units will be designated affordable. Approximately 6,590 square feet of retail space will be located across the building’s first two levels. Resident amenities will include a communal rooftop deck with sweeping Boston skyline and harbor views. A sun-bathed landscaped public courtyard will be located on-site fronting B Street. Last week, the City of Boston’s Zoning Board of Appeals (ZBA) approved The Chandlery, a new mixed-use development in South Boston featuring 114 residential units and 6,590 square feet of ground-floor retail. The $55 million project has now received all necessary approvals and can proceed with construction, which is anticipated to commence in the 4th quarter of this year; The Chandlery is expected to open in the 2nd quarter of 2019. The Chandlery, a new building featuring 114 residential units and 6,590 square feet of ground-floor retail located steps to Broadway Station, was approved at last night (May 11th, 2017)’s Boston Planning & Development Agency (BPDA) Board Meeting. In response to community feedback, the building has been reduced by 36 residences, to 114 from 150 as originally proposed. Likewise, affordable units have been reduced to 20 from 70 as originally proposed, and the building's height has been reduced to 6 stories from 8 as originally proposed. The Chandlery will require additional approval from the City of Boston’s Zoning Board of Appeals in order to proceed with construction. The Chandlery is anticipated to start construction in the 4th quarter of this year and open in the 2nd Quarter of 2019. Developer Mark Edwards has filed an Expanded Project Notification Form (EPNF) with the Boston Planning & Development Agency (BPDA) proposing to construct The Chandlery, a new building featuring 150 middle-income residential units and approximately 6,590 square feet of retail space located in South Boston steps to the Broadway rapid transit station; the following is a link to the PNF. Construction of The Chandlery would commence in the 4th Quarter of 2017, with completion and occupancy anticipated in the 2nd Quarter of 2019.